Tell us your email address and we'll get in touch straight away! 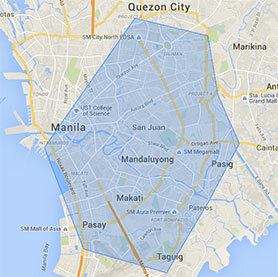 We cover the majority of metro manila. The cleaner sent to my place was amazing. She did a great job. Between work and the gym, i never have time to clean. Manila Maid is the perfect solution because I can come home and not worry about having to do any cleaning. My roommate and I book their service on a weekly basis and we highly recommend it! Manila Maid cleans our house once a week. After trying other agencies, Manila Maid is much more professional and convenient for us. I highly recommend them. I booked their service for a last minute cleaning because I was hosting a dinner for my balikbayan brother and our friends. I was so happy to find that they had availability! A maid came and cleaned the house thoroughly in under two hours! My friends were all impressed with how the place looked. I definitely recommend their service.